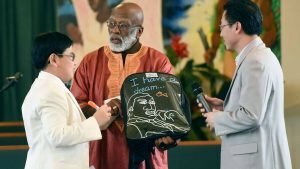 We name this backpack in memory of Pastor Dr. James Anderson of Christian Love Baptist Church in Modesto and the president of Modesto Police Department Clergy Council. Pastor Anderson saw Hien, the young inventor/entrepreneur, gave a speech about ChalkWild & its mission at Boys & Girls Club of Stanislaus event at King Kennedy Center. He invited Hien to speak at the annual Dr. Martin Luther King Jr. celebration at his church the week after. This event is attended by all the dignitaries like the mayor, chief of police, sheriff, city council members, supervisors… every year. This gave Hien & ChalkWild a great exposure & gave Hien more confidence with public speaking. Pastor Anderson gave some kids this amazing opportunity with the presence of community leaders & dignitaries to shine a light on their achievements. He has helped so many young people as well as people in his community. Like God put his son on earth to save the people. God put Pastor Anderson on earth to help his community. God called him back to be with Him last year. It was a great loss for the community. We are still saddened & missing him, especially during the cerebration of Dr. Martin Luther King Jr.